So, we’re going to talk about roses now. Those beautiful, romantic, and oft sought afterflowering shrubs for your yard and garden. Those plants are so admired, that the Canadian government started breeding a “Parkland Series” rose going all the way back to 1962. The “Explorer Series” and “Artist Series” are also available at Jensen’s. The nice thing about these Canadian developed and bred roses is that they are on their own root system – they are not ‘grafted’ like the David Austin’s (though beautiful, are a lot more work to put to bed for the winter). Proactively use a slow release fertilizer such as Myke’s 5-3-8 rose food. Remember that the three numbers represent nitrogen (green growth), phosphorus (roots and blooms), and potassium (general vigour); so you can see that this product ups the ante for disease resistance with a high last number. It also is chock full of organic matter as its filler, rather than synthetic material, and is approved for organic production. One box is good for twenty average sized rose bushes. Reactively, you could use a natural-material garden fungicide to fight off black spot, rust, and powdery mildew. Safer’s ‘Defender’ uses a the good old elemental sulphur as the basis for its spray solution. Remember, your other plants will also benefit from this product if they succumb to some fungal diseases. 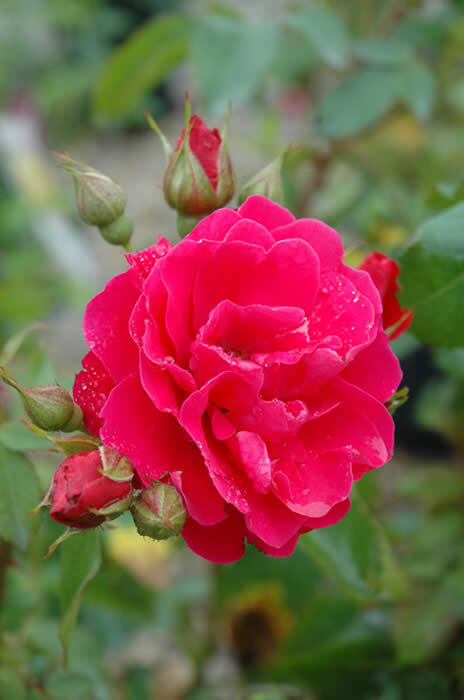 So, if you want to add a little romance to your yard, and have rich well drained soil that receives at least six hours of sun, then come visit us for a rose plant or three – they are available in various sizes, and forms, (and even coloured foliage). See you soon!